Projection systems tend to look at reality a whole lot more soberly than us humans, who can fall madly in love with a player on the basis of aesthetic appeal alone. That’s why most offseason columns here at FanGraphs reviewing free-agent acquisitions tend to damper down instead of ramp up excitement. So it is a meaningful testament to Russell Martin’s skills that, upon being signed by the Toronto Blue Jays to a five-year, $82M contract as a 31-year-old catcher — i.e. after Martin has already sustained several lifetimes of knee-shredding, cup-checking abuse in baseball’s most brutal position — the deal was graded positively in these pages by Mr. Sullivan. In the offseason after winning the 2014 award for American League Comeback Player of the year, Chris Young — that’s the exceptionally lanky pitcher Chris Young, not the merely lanky hitter Chris Young — received zero attention on the free agent market. It took until about mid-way through Spring Training until a team signed Young — on March 7, the Royals signed him to a very interesting one-year contract with a $0.675M base salary and a whopping $5.325M in incentives. That’s very little guaranteed money, though, especially compared to the 2014 National League Comeback Player of the Year, Casey McGehee, who is guaranteed to earn $4.8M from the San Francisco Giants this season despite performing below replacement level thus far. On the eve of this season, we at FanGraphs compiled our annual Positional Power Rankings, examining the projected depth charts at every position for every team. Things are very exciting at the top of these rankings — monitoring the center field situation for the Angels, for example, will be a thrill for the foreseeable future. Boy, this whole Kris Bryant situation sure got heated fast, right?! On the off-chance you haven’t been keeping tabs on the MLB’s most philosophically layered spring training headline, I recommend reading Mike’s proposed rule changes; Nathaniel’s examination of what the Players’ Association could do next; and Jason Wojciechowski’s appeal to ethical business practices over at Beaneball. Alas, this is not the first time a bright new prospect has been sent to the minors under, ahem, dubious circumstances. At this moment, Bryant’s saga cannot be discussed without heavy reliance on hypotheticals: questions of how his trip/sentence to Iowa will affect the Cubs’ 2015 season, the Cubs’ 2021 season, or Bryant’s lifetime earning potential are all, ultimately, unknowns. But we can learn from history and see how prior service-time-oriented decisions have played out for other teams and their marquee prospects. Up first: the consensus greatest player in the game. What do we have here? For an explanation of this series, please read this introductory post. As noted in that introduction, the data below is a hybrid projection of the ZIPS and Steamer systems, with playing time determined through depth charts created by our team of authors. 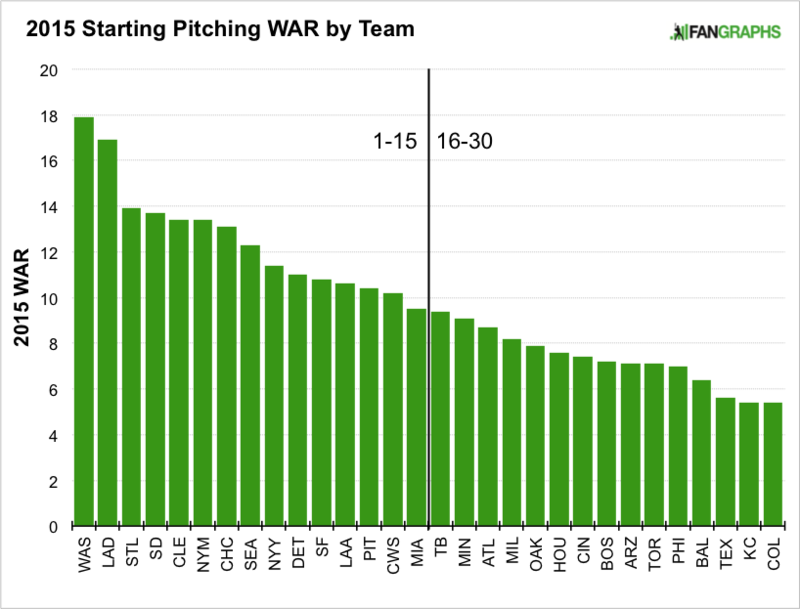 The rankings are based on aggregate projected WAR for each team at a given position. Yes, we know WAR is imperfect and there is more to player value than is wrapped up in that single projection, but for the purposes of talking about a team’s strengths and weaknesses, it is a useful tool. Also, the author writing this post did not move your team down ten spots in order to make you angry. We don’t hate your team. I promise. My previous investigation of 2014’s best hitting and pitching performances in a loss was motivated by years of wondering what the vibe/conversation/protocol is in a professional locker room after such an extreme, heart-wrenching performance. Contributing an excellent performance in a loss is far from the only for emotional dissonance to work its way into the clubhouse. Like: what about players who perform very badly on a given day — but on days when their team manages to pull a victory out of the rubble? Baseball orthodoxy declares that players who perform exceptionally in a loss must still mumble about how it was all for not, what with that L in the standings. The player who performs dreadfully in a win, though: he can’t really take any satisfaction about the W his teammates put together, right? But: surely there is some relief in everybody being in a good mood and perhaps being willing to overlook a golden sombrero. The Washington Nationals — who once earned exactly 59 wins in consecutive seasons (2008-09) and who are presently one of baseball’s most-feared, most-bankrolled teams — are entering their eleventh season playing their home games in America’s capital. That means it’s been more than a decade since the Montreal Expos played their final season in Canada, in front of an average of about 9,000 fans a game. A decade is basically a few generations in baseball-time — Ben Sheets and Jim Edmonds were Top-10 in WAR during the Expos’ last year — and so we are inching ever closer to a sad milestone for nostalgic Quebecers: some time very soon, the Major Leagues will be down to their very last ex-Expo. Last time, I looked at 2014’s five best pitching performances, by WPA, in a losing effort. This time we take a gander at the five best offensive performances that came in a loss. Just like the pitching performances we looked at earlier, there is one very specific way to appear on this list: have a career day during a close game, and then watch your bullpen mess the whole thing up. It should be noted that the single greatest individual game in baseball history — which would be a whopping 1.503 WPA, or more than Ben Zobrist, Salvador Perez, or Yan Gomes provided all of last season — came from a hitter in a loss. The date was August 12, 1966, and the man was Art Shamsky, who would ultimately contribute 6.8 WAR during his eight seasons as a utility outfielder. On August 12, 1966, Shamsky did not even receive the start, but was allowed to chill in the dugout for the first seven innings before being brought in on a double-switch as a defensive substitution in the top of the eighth. In the bottom of the eighth, Shamsky cranked a two-run homer to give his Cincinnati Reds a one-run lead over the Pittsburgh Pirates. The Pirates would tie the game in the top of the ninth, sending the contest to extra innings. The Pirates scored one run in the top of the tenth, which Shamsky answered with a solo homer. The Pirates then scored two runs in the top of the eleventh, which Shamsky answered with — duh — a two-run homer. In the top of the thirteenth, the Pirates scored three runs off of the impeccably named Billy McCool, and the other hapless Reds went down in order in the bottom of the 13th, leaving Shamsky in the hole on the game’s concluding pitch. We recognize you and mourn with you, Art Shamsky. I’m always curious about what goes on inside a player’s head, post-game, when they’ve delivered a monster performance — but then their team ends up losing. Yeah, yeah: half-naked at the locker most every ballplayer will preach that none of it matters without that W. But, I mean, some of these individual performances are really good, and it takes some significant unraveling on the part of the other 24 players for the team to still end up with the L.
As an MLB team, it’s awful hard to reduce your payroll. All those long-term contracts you agreed to years ago come equipped with incremental annual raises, and then the free agent market inflates every year in the meantime. Cutting payroll can’t happen by accident: it’s a shift in organizational direction across all tiers of the operation.